A cellphone video is making the rounds on social media showing a Mississippi teacher twerking in front of a class. 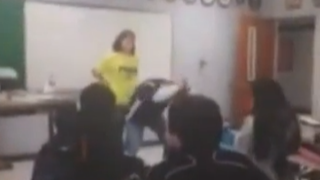 The video shows a male teacher bent over wiggling in front of another teacher. Students can be scene in the video gasping and turning away from the site of the gyrating teacher. One student can be heard saying, "Oh, my God." School administrators say the video is not what it appears. "The two teachers had good intentions to show how silly students look when they dance in inappropriate ways. This video was taken out of context," Allyson Killough, Olive Branch High principal, told News Channel 3. "Our responsibility as teachers is to be a good example and act professionally. A video clip out of context can have multiple meanings and be misinterpreted," she said. While it is debatable as to whether or not the teacher's movements actually are in fact twerking, some parents think teachers gyrating in front of students—no matter the context—is inappropriate. "They shouldn’t be teaching my children how to twerk at all. That’s not good,” parent Michelle Davis told the news station. But some students think people are making too much out of something you can see on TV nearly every day. "They’re making a big deal outta nothing,” said student Ryan Sanders. The teachers will face no discipline for the video, and they will probably leave the dancing to the students from here on out. Read more at News Channel 3.